Oshun is the African Yoruba deity that governs over rivers, love, beauty, children and everything one may consider sweet, sensual and of course fun. She is that drive and sweetness that lead many to do what they love because without love and peace how can you set out to do anything with passion? Her color is the many ranges of yellow and gold and of course copper. The number associated with Oshun is five and honey is her specialty. 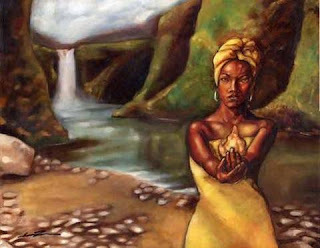 Many flock to oshun for issues involving infertility, love and health. The river is where you would go to bring her your offerings or just simply speak to her about anything and everything. Oshun’s ambiance consists of beautifully decorated things such as mirrors, anything peacock, sunflowers and cakes. Sensuous aromas also are her favorite and helps those who admire her almost exude her same aura. Oshun loves music and parties where she can laugh, mingle and become the center of attention with her sweet and sensual ways. A yellow candles is also an intimate way in which you can offer and speak to her. 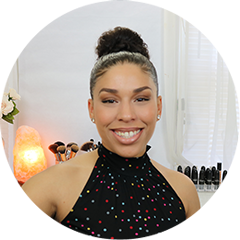 Placing a yellow candle surrounded with a few of her favorite things like honey and sunflowers is a simple way in which you can tap into Oshun’s divine energy. A facial mask I like to use in honor of beautiful oshun is a sunflower seed oil , honey mask with one drop of chamomile essential oil for a soothing soft dewy complexion which leaves you exuding oshuns sensuality and confidence.